YANGON, Myanmar—Ghin Gar Cherry Trading Co. recently outfitted Novotel Yangon Max with a complete HARMAN audio solution to provide exceptional sound quality and coverage for a wide range of events. 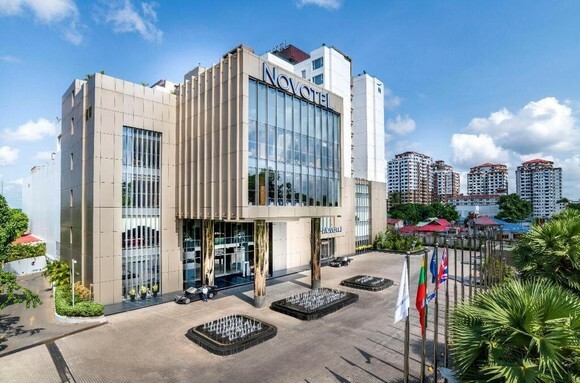 Founded in 2014, Novotel Yangon Max is a five-star luxury hotel located in the Myanmarese capital of Yangon. In addition to private rooms, suites, a fitness center, spa, lobby bar and music venue, Novotel Yangon Max features nine modern event spaces, including a main ballroom, junior ballrooms and conference rooms. In order to ensure world-class audio quality during events, Novotel Yangon Max hired local sound integrator Ghin Gar Cherry Trading Co. to outfit the hotel’s event spaces with versatile HARMAN Professional audio systems, consisting of solutions by JBL, Crown, dbx, Soundcraft and AKG. Ghin Gar delivered exceptional audio performance throughout the hotel’s event spaces using an array of JBL speakers. JBL Control 321CT and Control 312CS ceiling speakers enabled the Ghin Gar team to seamlessly integrate crystal-clear audio into each room’s unique architectural and aesthetic features. Ghin Gar outfitted the main ballroom with JBL VRX 938LAP speakers, delivering powerful line array performance for high-profile events. Ghin Gar also included JBL EON 515XT, LSR 2328P and CBT 100LA speakers for events that require more flexible or portable sound reinforcement. The speaker systems are powered by Crown CDi 1000, XLS 802 and LPS 2500 amplifiers, and optimized with dbx DriveRack 260 loudspeaker management systems. Events at Novotel Yangon Max benefit from AKG CS3 conference microphone systems, which utilize a modular design and interchangeable microphones for maximum flexibility in any conference situation. Finally, Ghin Gar included Soundcraft FX16ii and EXF12 analog mixers and a Soundcraft Si Expression 3 digital mixing console, enabling Novotel Yangon Max’s staff to quickly dial in polished, professional-sounding mixes for events of any size. © 2018 HARMAN International Industries, Incorporated. All rights reserved. Harman Kardon, Infinity, JBL, Lexicon and Mark Levinson are trademarks of HARMAN International Industries, Incorporated, registered in the United States and/or other countries. AKG is a trademark of AKG Acoustics GmbH, registered in the United States and/or other countries. Features, specifications and appearance are subject to change without notice.